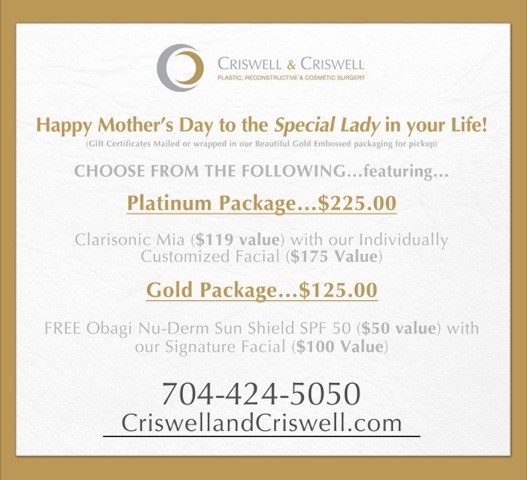 Criswell and Criswell Plastic Surgery has you covered for Mother’s Day 2013! As everyone knows (and if you don’t by now you should) Mother’s Day is this Sunday, May 12th! Don’t wait till the last minute or scramble to put a gift together. We have it all taken care of for you here at Criswell and Criswell Plastic Surgery with two awesome gift packages. Show the special lady in your life how much they matter with our Platinum Package or our Gold Package. All gift certificates will be mailed or wrapped in our beautiful gold embossed packaging for pickup, so you don’t even have to worry about wrapping! Call now at 704-424-5050 or come by the office to order your package. Be a hero on Mother’s Day and give that special lady a gift they will TRULY appreciate! We look forward to seeing you, visit either one of our offices, our SouthPark location or the Ballantyne Village location. For more information about Dr. Bryan Criswell and Dr. Kara Criswell, and Criswell and Criswell Plastic Surgery please visit: https://www.criswellandcriswell.com/blog/.